Whether you need to eat away your pre-Christmas stress or simply need a good excuse to eat something other than your loathed office sandwich, this week is full to the brim with comfort food. From cocktails to cookie dough, you’ll be one happy camper. Libertine’s new courtyard bar is the pourfect excuse for a cheeky sip or two. Bar Jardin’s cocktail list is as long as it is satisfying, with bites including Vietnamese pork quiche and oysters with nam jim. Back that hass up, New Farm is gaining a wholesome new vegan joint! Dicki’s will take the ick out of basic vegan options by providing nothing less than excellence. Noteworthy bites include roast onions with pearl barely ponzu and crisp buckwheat to smoky mash with tempeh and herb lemon sauce. Lettuce weep with joy. Grown is officially all grown up, now providing lovers of all things plant-based with delicious dinners! You can expect the likes of hakuri turnips with pea puree, crispy rice and mint, and pan-fried zucchini with roast cashew puree. Rock ‘n’ roll down to All Inn Brewing Co. for the Christmas party for the year. Replace carols with the live stylings of Heavy Roller and you’ll be in Nirvana. Phatboys food truck will be serving up killer burgers and bites so that you’ll be all fueled up and ready to mosh. Yeah, you read that correctly. 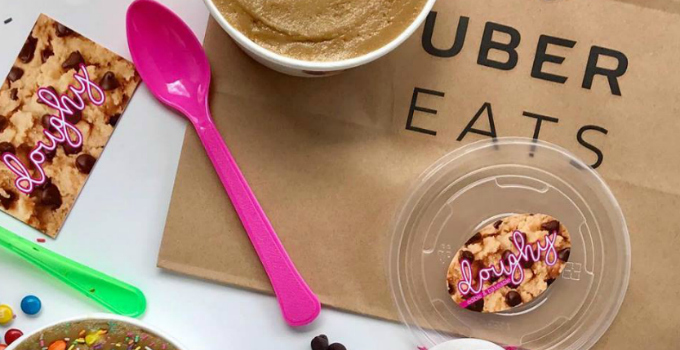 Doughy edible cookie dough is now available on UberEATS for those just got dumped, just failed a crucial exam or just need the damn cookie dough moments. Our bodies are ready. It’s beginning to taste a lot like Christmas at My Gelato! Available until Christmas Eve, you can indulge with festive flavours such as Panettone (a take on the traditional Italian Christmas dessert), Aussie Christmas pudding with cherries, and A Summer Christmas with orange zest and choc chips. We SCREAM. Words by Nicole Portacha – the gourmand who has no fear when it comes to raw cookie dough.